Some of the deals mentioned in our report were recognised in our most recent Deal of the Year Awards. Lawyers from around the region convened at São Paulo’s Hotel Unique for our annual charity awards ceremony, where we celebrated the winners. We look back at the highlights of the evening, which was all in aid of pro bono clearing houses. Meanwhile, as the presidential elections taking place across Latin America highlight the changing shape of its political climate, the United Kingdom is also undergoing a transition as it prepares for Brexit. 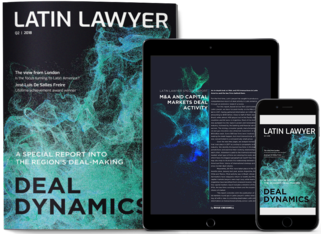 In this issue, we ask how withdrawal from the European Union might affect the London legal market’s relationship with Latin America. As the United Kingdom explores different trading routes, are its lawyers taking a closer look at opportunities in this region? Skadden Arps Slate Meagher & Flom partner Filipe Areno and counsel Hilel Pohulanik consider how the region’s political and economic outlook will influence deal activity. The winner of Latin Lawyer’s Lifetime Achievement Award, José Luis de Salles Freire, built TozziniFreire Advogados into an elite institution. He reflects on how he embarked on a new approach to rendering legal services. A planned takeover of the Buenos Aires metro system by Transport for London is one way the UK could strengthen its commercial relationship with Latin America as it prepares to leave the European Union. The country’s place in the world is set to change, but will Brexit reduce or increase the distance between London and Latin America?